The recent upgrading of my Yaesu FT-450 to an Icom IC-7400 has forced a rethink on aerial selection and their sharing between the various rigs. The IC-7400 is intended as a spare or standby rig in case my homebrew gear gives problems and I am very pleased with its performance. 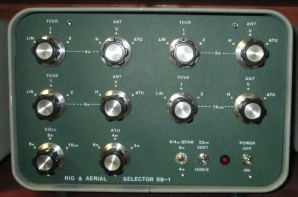 However, reaching behind the rig to move aerial connectors has proved to be inconvenient and has moved my proposed RF Switchbox up the list of priorities. 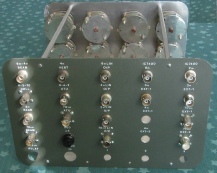 The switch box is used to ease the problems of selection and sharing aerials and has been designed in the Heathkit style to fit into an SB600 loudspeaker box with the speaker removed and new front and rear panels and chassis constructed. 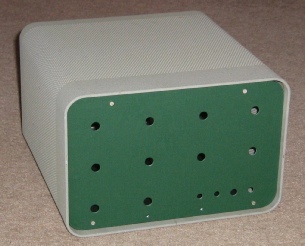 The internal structure consists of a flat chassis tying the lower edges of the front and rear panels together with a pair of aluminium support rods at the top of each panel. 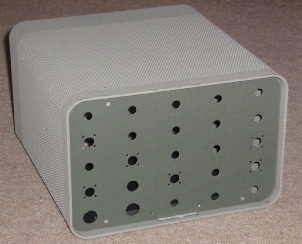 The original SB-600 internal support brackets were removed as the chassis is drilled and tapped to accomodate the mounting feet which also hold the internal structure in the correct position. All inter-switch and socket RF wiring uses 6mm Teflon coaxial cable type RG142 which will tolerate short periods of very close soldering without melting the insulation. All rotary switches use a 60 degree index, dual back to back rotors wired in parallel to reduce the contact resistance and increase the current carrying capacity. Front and rear screening plates are employed around each wafer to get close to a microstrip like environment - the resulting impedance is set by the wafer dimensions and the minimum screen to wafer spacings. The resulting impedance is higher than 50ohms but the discontinuity is extremely small compared to a quarter wavelength. The coaxial cable must not be bent too tightly as the inner insulation will distort so I have used a bend diameter of about two and a half inches. Care is also required when cutting the outer and inner insulation layers to avoid catching the braiding and solid centre conductor - I use a sharp modellers scalpel. Minor nicks to the braiding do not usually cause any problems as the solder will wick into the braiding, bypassing any small cuts but there is a more significant risk with nicking the centre conductor which may then fracture if any bending pressure is applied. 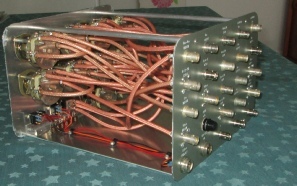 The switch for 23cms provides DC to an external coaxial changeover relay. The partially wired unit can be seen to the right. The following pictures show the completed unit front and rear panels. 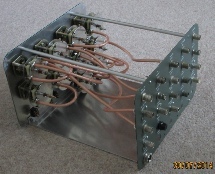 The photo to the right shows the completed internal wiring - mostly in 6mm diameter PTFE coaxial cable. 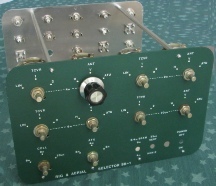 The switch contacts will probably be the limiting factor in terms of RF power and each switch has front and rear contacts wired in parallel to reduce the inductance and contact resistance. The wiring was completed from the bottom up as getting past cables already in place is not easy. 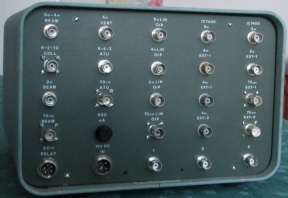 The DC supply comes from the station console.